It's all change once more with the revised weapon system for Destiny 2. 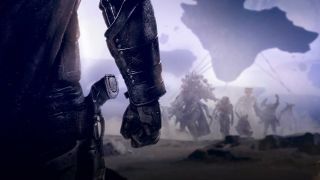 Just as we were getting used to Bungie's reimagining of Destiny's inventory for the sequel, the developer has tweaked things again for the sci-fi shooter's latest expansion, Destiny 2: Forsaken. The latest overhaul is a liberating one, freeing up your inventory so you now able to use your guns more flexibly, popping shotguns into your primary slot, for instance, or dropping your favourite sniper rifle into your energy holster. Why should you use it? To be fair, most of us don't want to use it - it's Cayde's beloved cannon, after all. But if you're not as sentimental as us, it's super powerful. Enjoy it. Sniff. Why should you use it? This sword shoots arc bolts at enemies as well as hack 'n' slash 'em into shreds. What's not to love? Why should you use it? What it lacks in looks, the Cerberus+1 makes up for in power. Named after the hellhound itself, it has not three heads but four, and shoots 360 RPM in four directions. Why should you use it? Holster this grenade launcher and it'll automatically reloaded after a short period of time - perfect to pull out at short notice without having to worry about reloading. Why should you use it? We didn't use to like Sidearms all that much either, to be honest, but this is a particularly impressive gun that's lightning fast and deadly, particularly on AI enemies. Why should you use it? Like all shotties, this returning favourite is devastating at close range thanks to a shrapnel perk, but it's also quick to fire, too. They'll hate you in the Crucible. Why should you use it? While not ideal for crowds, if you can get off five successive shots and land them all perfectly, they'll bind together and become explosive - not fun for the foe you're targeting. Why should you use it? Hit your target and you'll dish out even more damage when your arrows explode. Why should you use it? It's a Trace Rifle. It's devastating. 'Nuff said. Why should you use it? It's back! Perfect for quick switching between long- or short-range shots that additionally shoot arc lightning that temporarily blind your opponents. Why should you use it? There's a reason this list is full of combat bows, you know. Equip either explosive arrow heads or snapshot sights and you'll pretty much be unstoppable no matter who you're taking on. Why should you use it? Been murdered by this a lot in the Crucible recently? Yeah, us too. There's a reason this Fusion's making a revival, especially in PvP. Make the most of it, Guardian - who knows when this'll get debuffed! Why should you use it? Get a critical hit, and this bow sends electrical bolts into your prey - perfect for anything that you need to damage quickly, particularly High Value Targets and bosses. Why should you use it? This rocket launcher fires two rockets simultaneously - yes, really - making it a deadly aid when it comes to crowd control. Why should you use it? Yes, another Trace Rifle, and this one's able to fire a light beam at three different intensities depending upon how hard you pump that trigger. Plus, your power is intensified if you collect orbs of light whilst shooting, as well as auto-reloading. Why should you use it? It's like someone's given you x-ray glasses. Aim through walls and take out other foes with collateral damage, too. Oh, and before you break down everything in your vault… randomised gear cannot be reacquired, so if you've an old favourite with a particularly sweet roll stashed away, check before you dismantle it!